Urolithiasis in the Russian Federation (2005-2016) Apolihin O.I., Sivkov A.V., Komarova V.A., Prosyannikov M.Yu., Golovanov S.A., Kazachenko A.V., Nikushina A.A., Shaderkina V.A. Restoration of disturbed spermatogenesis after intratesticular transplantation of the neonatal testicula tissue Kirpatovskiy V.I., Kudryavcev G.Yu., Kudryavceva L.V., Frolova E.V. Primary-multiple cancer of transitional epithelium: diagnostics and peculiarities of the disease Teplov A.A., Grickevich A.A., Stepanova Yu.A., Miroshkina I.V., P'yanikin S.S., Dunaev S.A., Arevin A.G., Morozov A.D.
A modern view of prostate cancer screening, the organization of medical care in an outpatient setting Popov S.V., Orlov I.N., Karasaeva L.A., Gul'ko A.M., Matich A.I. Radical prostatectomy with preservation of Retzius' space. Application experience and its results Nevirovich E.S., Boriskin A.G.
Fast in vivo assessmant of the urinary bladder connective tissue state for evaluation of the radiation injury severity Strel'cova O.S., Moiseev A.A., Kiseleva E.B., Maslennikova A.B., Tararova E.A. Our experience of micropercutaneous nephrolithotripsy application in the treatment large kidney stones Popov S.V., Orlov I.N., Martov A.G., Asfandiyarov F.R., Emel'yanenko A.V. Metabolic risk factors and urinary stone formation. Study IV: Prediction of the chemical composition of the stone in vivo according to metabolic parameters Golovanov S.A., Sivkov A.V., Prosyannikov M.Yu., Drozhzheva V.V. 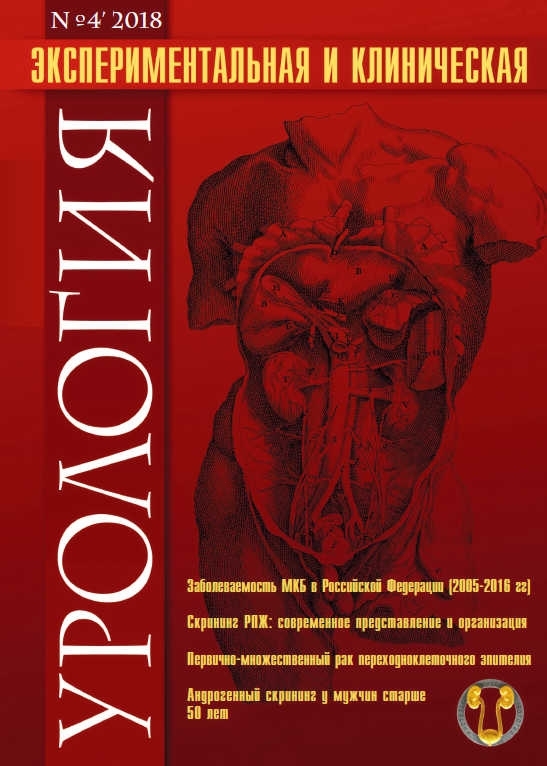 The role of phytotherapy in metaphylaxis of urolithiasis after extracorporeal lithotripsy Davidov M.I., Igoshev A.M.
Androgenic screening in men after 50 years with prostate diseases Kamalov A.A., Vasilevskiy R.P., Ohobotov D.A., Neplohov E.A. Chronic pelvic pain and dysuria in patients with metabolic syndrome Shkodkin S.V., Polischuk A.V., Chirkov S.V., Shushpanova K.D. Our experience in application of hexane extract of Serenoa Repens (Permixon) extract in case of chronic prostatitis Sivkov A.V., Sinyuhin V.N., Prichepa V.V., Apolihin O.I. Peculiarities of infravesical obstructions caused by surgery of benign prostatic hyperplasia and their treatment in a single center Kogan M.I., Kryuchkova N.V., Gluhov V.P., Mitusov V.V., Sizyakin D.V., Bychkov A.A.
Urethroplasty of neophallus with radial forearm flap with prefabrication of urethra by buccal graft (clinical case) Sokol'schik M.M., Kyzlasov P.S., Bokov A.I., Kolpacinidi F.G. Treatment of neurogenic bladder dysfunction and secondary enuresis in children and adolescents Morozov V.I., Baybikov R.S., Zakirov A.K., Yul'metov G.A. Comparison of the results of the correction of the median and proximal hypospadias in children using the Graft Tubularized Incised Plate method Kagancov I.M., Surov R.V., Dubrov V.I., Svarich V.G., Golovin A.V. The role of markers of acute kidney damage in assessing kidney function with its ischemia Miroshkina I.V., Grickevich A.A., Baytman T.P., P'yanikin S.S., Arevin A.G., Kalinin D.V., Demidova V.S., Teplov A.A.